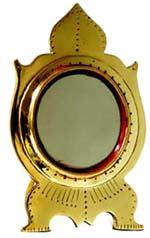 Aranmula Kannadi is a famous mirror that originates from Aranmula in Kerala in India. This traditional metallic mirror is very popular and in huge demand as it is believed to bring prosperity and luck. There is an interesting story associated with the origin of Aranmula Kannadi. The origin of the Aranmula Kannadi is traced back to more 500 years, when a local ruler invited artisans from Sankarankovil in the Tirunelveli District in Tamil Nadu to make brass idols for temples in his kingdom. One of the artisans named Parvati Amma had a dream about a secret combination of alloys. She used to the combination to make the crown of a murti in one of the temples. The crown was so beautiful that it attracted people from all the nearby places. The ruler then asked Parvathi Amma to make a metal mirror with the same combination to be placed behind the murti at the famous Aranmula Sri Krishna Temple. It is from then onwards that the tradition of making Aranmula Kannadi began. A special combination of copper, tin and zinc goes into casting of the alloy that makes the Aranmula mirrors and this combination is only known by a few families.